I think this tag turned out really lovely. I've had a brief love affair with foil, and today's card reflects those few passionate (and frustrating moments). It was a brief affair mainly because I bought a cheap laminator and the foil didn't stick down properly on my printed patterns, so it wasn't joy to use. Despite all of that, I think this card featuring the monster clear stamps turned out pretty neat. 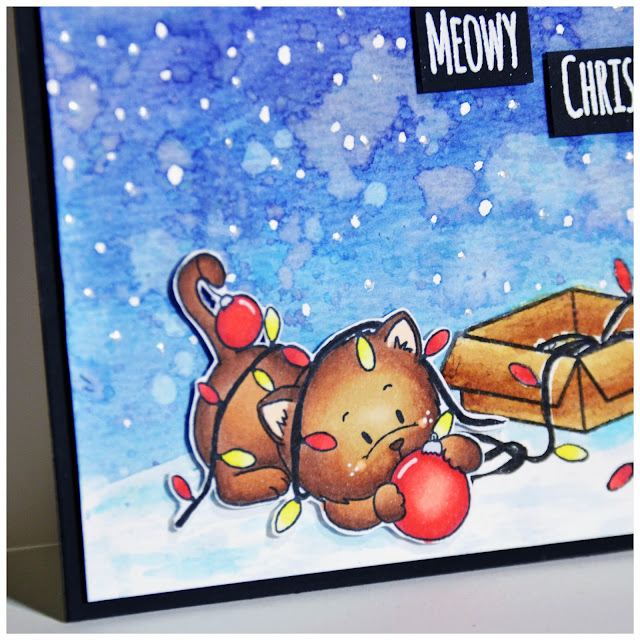 If you don't have foil or a foiling machine, you can achieve a similar look with Gilding Flakes. I've used them often with stamped images and the results are just lovely. No need for a laminator, hot iron, or laser printer. You can simply stamp a pattern with glue and apply your flakes — and voila. As you can see, I kept the card design very simple and basic to really have the shimmer of the foil take center stage and draw the focus to the monster in the middle. The sentiment, stamped in pigment ink, matches the overall color scheme and is a nice change from my standard black sentiments. Hello crafty friends! It's Jess from JessCrafts.com. 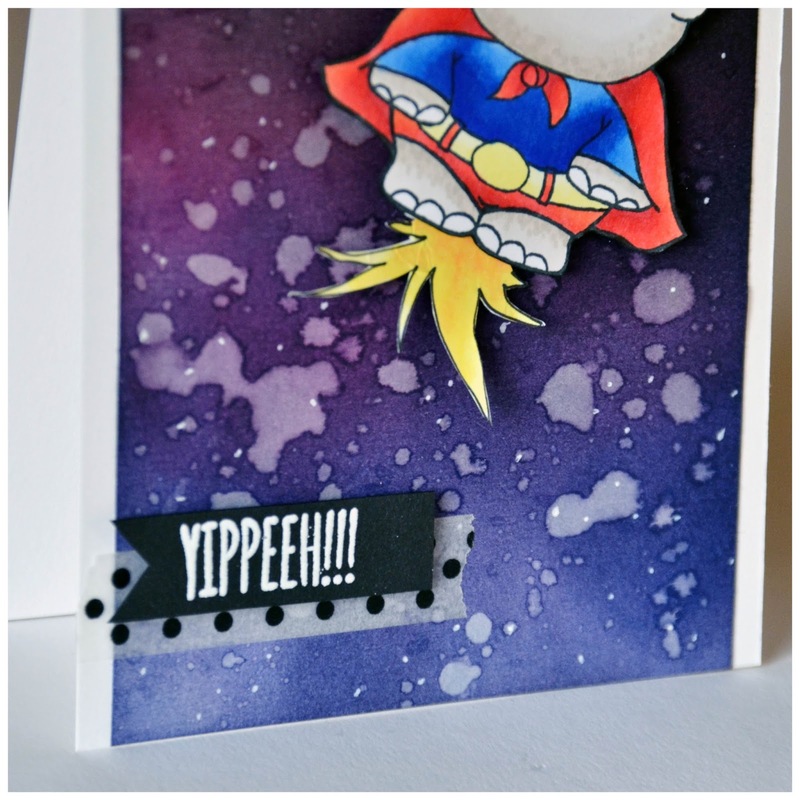 Today I am sharing a card made with the Halloween Cat Bat Owl digital set. This is an amazing value. You get 5 digital stamps for just $2.50! I colored the two large images and paired them with a stenciled background. For more on how I made them check out my video. I love how you can resize digital stamps to fit your project. I really wanted these critters to be prominent but let the background also shine and being able to adjust the scale of them really helped with those goals. The standalone pumpkin and hat in the set are particularly awesome because you can combine them with other stamps to make a non-holiday set work for Halloween. Just re-size them to fit the scale of the other stamp, fussy cut and assemble. I had originally intended for this card to be a clean and simple one layer design, but I accidentally smooshed some ink from my finger onto the original card base so I couldn't keep it clean and simple anymore. This smear was just too obvious. 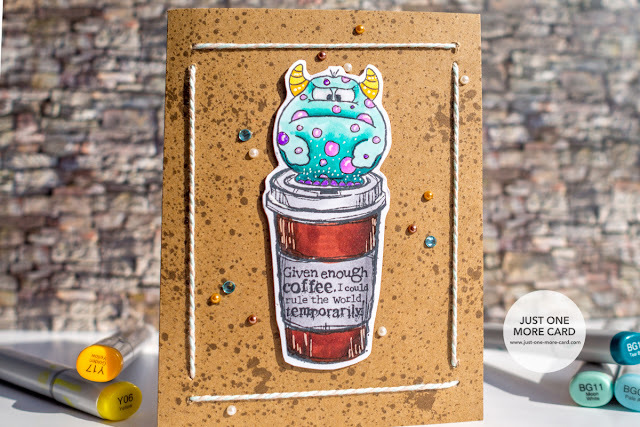 My workaround, if I may call it that, was too fuzzy cut out the monster and the coffee cup and mount it onto a kraft card base, which works out perfectly with the coffee theme. For additional interest, I added some twine which reflect the color of the monster and the brown of the coffee. A few gemstones at some sparkle. Thanks for stopping by today, and I hope to see you again soon! 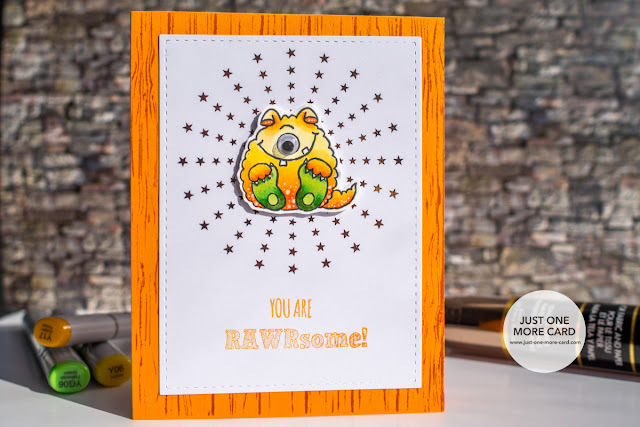 This is Joyce from Enjoyscrappin2 and today I've made this simple vellum shaker card using Gerda's rubber stamp, Monster kid. This adorable kid is available in both the digital and rubber stamp. 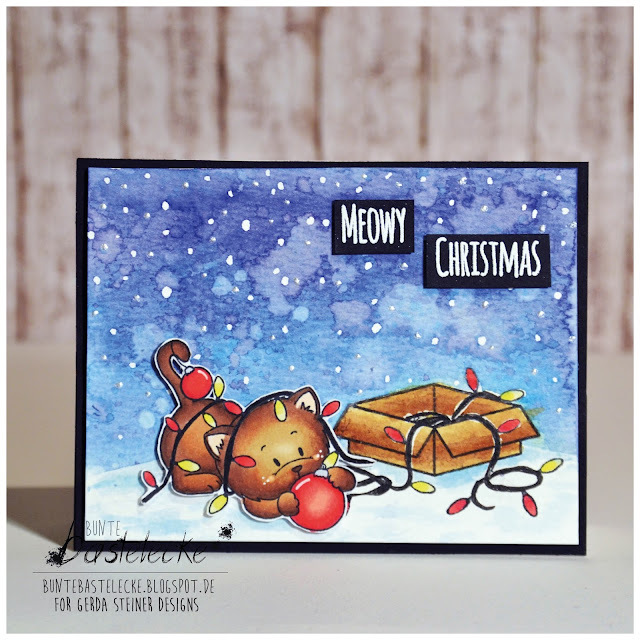 Gerda's rubber stamps are super high quality and very deeply etched, which will give you a fantastic impression, each and every time. Her rubber stamp comes in bare rubber form, which means it doesn't have the foam that you normally use to stick onto your acrylic block. You can mount them yourself very easily, using the cling foam mount. However, I prefer to use mine a little differently, which I share on this video. I stamped out the image onto a watercolor paper and used the faber castell's watercolor pencils. I also made this simple shaker element using the colored vellum, as you see in the picture. Go ahead and check out the video for more information on how I made this easy shaker. All the supplies I used will be linked in my blog, if you 'd like to check that out as well. I thank you guys so much for stopping by and I hope to catch you guys next time. Thanks again. But it's not yet time for christmas - I wanted to show you at first my card featuring one of the new Mini Stamp Sets: Hippo in Disguise. What a cutiepie! I finally (!) 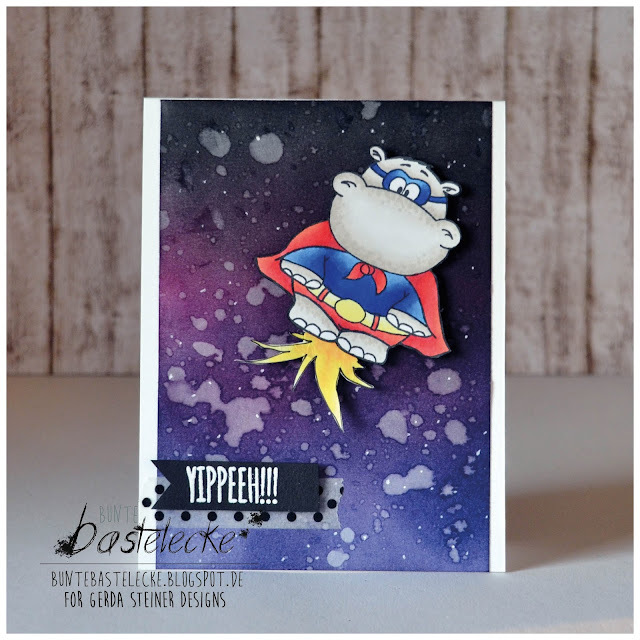 used Gerda Steiner Designs famous Hippo for the first time, yay! You get some nice build-up-stamps on that set to dress him like a superhero. But you can also stamp him "blank" without all of the superhero accessories. That's what I really like about that set! You can stretch your stamps just how you like it. Well, I colored him in the popular Superman colors and hand-drew a kind of a flame which I glued directly under his feet, so it looks like he's flying! I color blended a dark night sky with some Distress Inks and splashed some water droplets on it so that you get that starry look. I added some points with my white gel pen and also some Wink of Stella (which you can't see on the pictures). The last thing I did, was the little sentiment on the bottom of the card. I heat embossed the sentiment from the Happy Fall stamp set with my white embossingpowder and placed it on a stripe of Washi Tape, which used to be the embellished finishing touch. Hello friends, it's Chitra here with a card for you all!!! I played with our new Monster Party stamp set again, this grumpy monster is so cute that I had to make a card with him again!!! Here is how I made this card: 1) I first stamped the tiny images included in the set using a black ink and then used back of a tiny stamp to do some abstract stamping (if you have a solid stamps i.e; which is not a image you can use that as well). 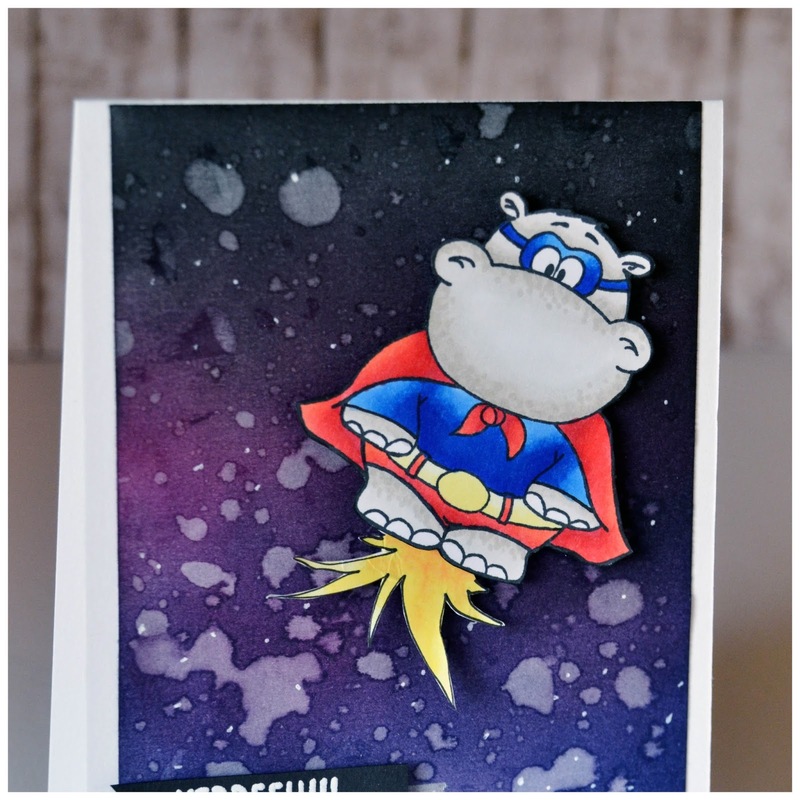 2) Then I stamped the monster onto Crafter's Companion ultra smooth cardstock and colored using copics. 3) To mute the background so the focus could be on the monster I added a piece of vellum and then foam mounted the image. 4) The sentiment "Do I Smell" is stamped directly onto vellum and "CAKE?" is stamped on a white cardstock and cut it out and foam mounted it. 5) Finally added some details to the image; white dots to his body and glossy accents to the eyes. Thanks for stopping by today and I hope to see you again next week. First I took a white panel and sponged some blue and purple distress ink for the background, for the planet I took some cork sheet and cut it free hand for the monster to stand on. The stars are die cut using Simon Says Stamp Holiday Shapes. The balloon is from Late but with Love stamp set which is paper pieced on a red cardstock. I added some white dots on the monster and added glossy accents to the eyes, highlighted the balloon and also added some glitter. The sentiment is added directly onto the cork sheet. Hope you liked my card, I really enjoyed making this card. 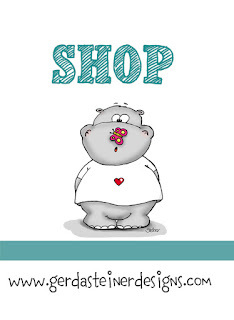 You can check all the stamps available in the shop here.